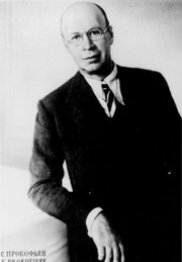 Sergei Prokofiev received his first piano instruction from his mother, who also encouraged composing. After studies with Gliere, he passed the entrance examination at the St. Petersburg Conservatory. There he studied with Rimsky-Korsakov and Liadov. He formed a lasting relationship with Sergei Diaghilev, who arranged his first performance outside Russia (Rome, 1915). The opera The Love of the Three Oranges and the Third Piano Concerto were premiered in Chicago in 1921. In Paris, where Prokofiev settled, Diaghilev produced his ballets during the years 1921-32. After returning to Russia, he composed Peter and the Wolf, the opera War and Peace, and the ballets Romeo and Juliet and Cinderella.